Where do I use my Peacocks voucher code? Click 'apply' and continue to checkout securely. Peacocks is an affordable high street store selling men's and women's clothing both online and in store. With everything from clothing to footwear and accessories, you can find all the stylish products you need for all your family at Peacocks. With lingerie, nightwear, a holiday shop and even a Jane Norman range, you're sure to find a diverse range of products to keep your wardrobe on trend, all year long. And with great affordable products and a fantastic offers and sale section, you can enjoy price reductions on almost every piece available on their website. At Peacocks you will find a huge selection of Shoes for Women, Men, Girls and Boys from Boots to Brogues, Formal Shoes to Sandals - there is also a great range of Trainers, Boots and Heels too. The choice of style is vast and you can choose from finishes like Metallic, Suede, Fur, Diamante, Snake Effect - the list goes on and on. So if you are looking for stylish, yet affordable footwear for the family - then be sure to browse the collection at Peacocks - remember, always check out NetVoucherCodes for the latest voucher codes. Peacocks are already an affordable fashion brand - but they make things even better for the consumer by offering regular sales. 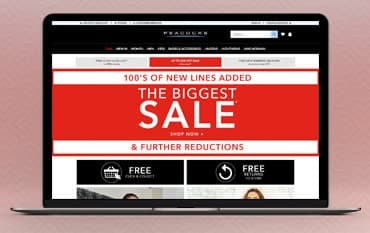 Whether this is a seasonal sale, clearance sale or even items on special offer - there is a bargain to be had on Women's Fashion, Menswear, Girl's Clothing and Boy's Fashion - so check out the latest Peacocks Sales today and see how much you can save on your order. Fashionable and affordable women's clothing is available at Peacocks, whether you are in need of Summer Essentials, Workwear or a new Winter Wardrobe you will find a huge selection to peruse... From Tops to Dresses, Nightwear to Maternity Wear - you will find everything you need to look stylish for less for any occasion. Jazz up your outfit by accessorising with a new Hat, Belt or Jewellery, not only do they stock fashion but also a wide range of accessories to add a little extra colour to any outfit. Standard UK delivery costs £3.95 per order and takes 3-5 days. You do not need to inform us before you return an item. You will find instructions enclosed with your order. For items bought online, you should return them in their original condition i.e. in original packing, within 28 days of receipt. They should be unworn, unwashed and complete with original labels. For faulty, damaged or items of unsatisfactory quality, we will refund delivery charges that you have paid to have the item delivered to you - unless it was sent with other items that you are not returning for any of the above reasons. Please call our customer services team on 02920 101560 or email online-customer-services@peacocks.co.uk and they will be happy to help you. What are your store opening times? WE have 400 stores nationwide. For contact details and opening times of your nearest store, please use our online store finder by clicking the store icon at the top of our homepage. If you’re looking for affordable fashion look no further than Peacocks, because whether you’re a man or a woman, or someone looking for fashionable clothing for your children you’ll be able to pick some fantastic clothing at Peacocks which won’t break the bank. There’s plenty to be having a look through at Peacocks, from your normal tops and trousers to jackets, shirts, dresses, footwear, accessories and more. Peacocks have plenty of years experience under their belts so there’s no need to worry about them disappearing as soon as you get to know them. Give Peacocks a shot today and see what fashionable bits and pieces you could find in your wardrobe soon!